Snow Leopard by Steffiheufelder. CC0 1.0 Public Domain. This is an important time for snow leopards (Panthera uncia). In August, representatives from all 12 snow leopard range countries will be meeting in Kyrgyzstan for the Global Snow Leopard Summit. The Snow Leopard Trust has started a petition to urge the leaders at this meeting to strengthen their commitments to save snow leopards, which you can view here. Therefore, this seems like the perfect time to release a quick-facts guide to this most enchanting of cats. No one knows for sure how many snow leopards remain in the wild, but the total is thought to be between 4,500 – 10,000 (Panthera, 2016b). 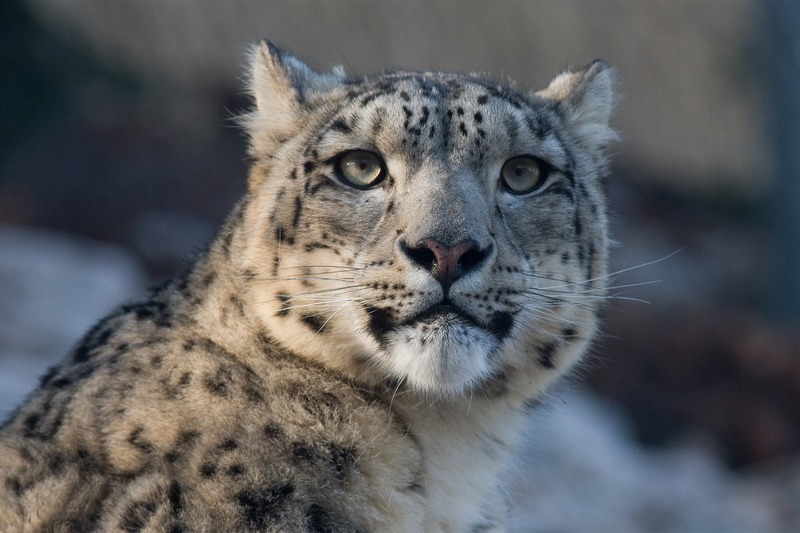 That number is falling, and snow leopards are listed as Endangered on the IUCN Red List. The wild snow leopard population has likely fallen by at least 20% in the last 16 years alone (Jackson, Mallon, McCarthy, Chundaway, & Habib, 2008). The snow leopard is the smallest member of the genus Panthera, despite being most closely related to the largest: the tiger (Panthera tigris). Male snow leopards weigh between 25 – 55 kg (55 – 121 lbs), whereas females have been measured between 21 – 53 kg (46 – 117 lbs) (Hunter, 2015). 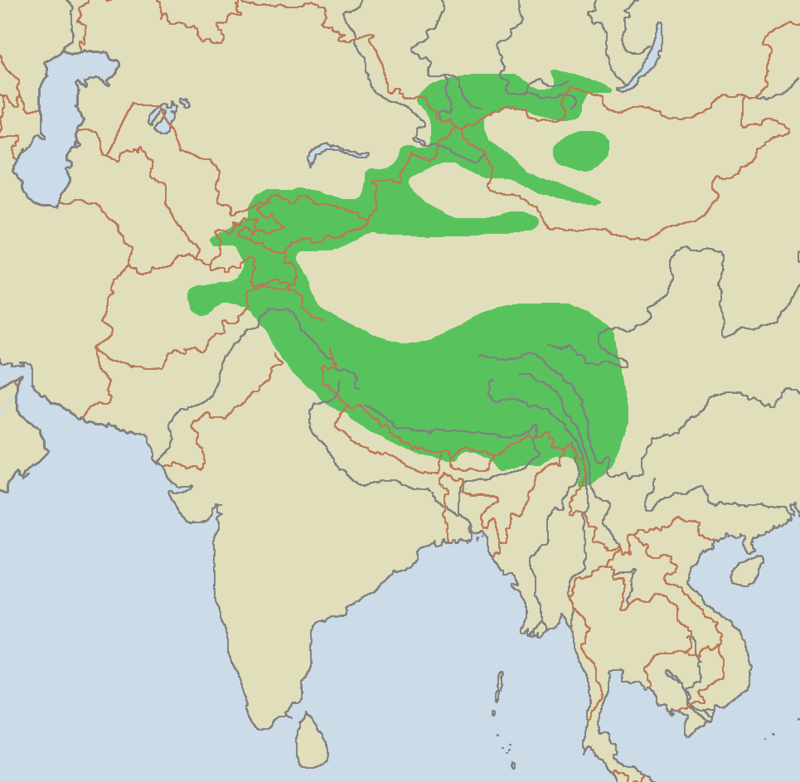 The snow leopard’s 1.2 – 1.6 million km2 range includes parts of Afghanistan, Bhutan, China, India, Kazakhstan, Kyrgyzstan, Mongolia, Nepal, Pakistan, Russia, Tajikistan, and Uzbekistan (Jackson et al. 2010; Jackson et al., 2008). While this might seem like a large distribution, keep in mind that snow leopards inhabit some of the harshest and most unforgiving landscapes on Earth. Snow leopards have been recorded at altitudes from 3,000 to over 5,000 m (9,842 – 16,404 ft) in the Himalayas and the Tibetan Plateau. However, they have been found at considerably lower heights (600 m/1,969 ft) in other parts of their range (Macdonald, Loveridge, & Nowell, 2010). Snow leopards favor rocky and rugged terrain, but they spend little time in dense forests (Hunter, 2015). Snow leopards are uniquely adapted to cold, mountainous habitats. They have oversized tails and paws for balance and grip, long and dense underfur, and enlarged nasal cavities that warm the air they breathe in. Snow leopards also possess superb camouflage. Their white and grey coats, sprinkled with black rosettes, help make snow leopards nearly invisible against rocky backgrounds (Jackson et al., 2014). It also makes them one of the most beautiful cats. As Dr. Luke Hunter (2015) points out, snow leopards are “unmistakable” (p. 175). Snow leopards can kill prey up to three times their own weight (Jackson et al., 2010). 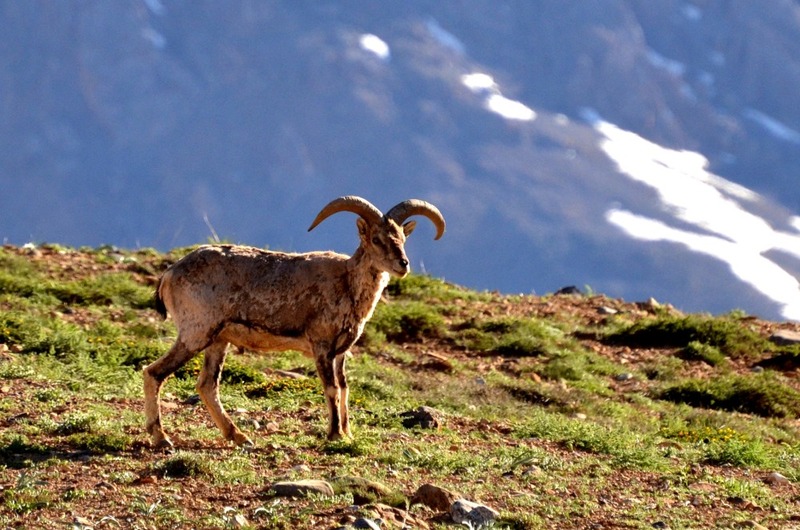 They rely heavily on mountain ungulates, with their range closely mirroring that of Asiatic ibex (Capra sibirica) and blue sheep/bharal (Pseudois nayaur). Snow leopards also take small animals, such as marmots and hares (Hunter, 2015; Jackson et al., 2008; Jackson et al., 2014). Livestock forms a significant part of snow leopard diet in some areas, which contributes to retaliatory killings of the cats (Hunter, 2015). Human-Wildlife Conflict. Snow leopards sometimes harm livestock, which engenders hostility and persecution by local people. In rare instances, snow leopards have been known to enter poorly-constructed corrals and kill up to 50 animals at once (Jackson et al., 2014). Habitat Loss and Degradation. This can take many forms, with the most pronounced being overgrazing of rangelands. An overabundance of livestock in one area can seriously harm mountain ecosystems, leading to declines in snow leopard prey. Increasing mining, infrastructure development, and climate change do not help either. Illegal Trade. Snow leopard fur is highly coveted in China and eastern Europe, where it is used for rugs and taxidermy (Hunter, 2015; Jackson et al., 2014). Snow leopard body parts are also valued in traditional Asian medicines (TAM), since they are thought to have curative properties (Panthera, 2016b; Jackson et al., 2010; Hunter, 2015). This demand will likely increase as poaching for the TAM trade continues to drive tigers, the target of choice, towards extinction. Many approaches are being used to help save snow leopards, and I cannot hope to do justice to them here. They include improving the conditions of mountain rangelands, education, combatting the illegal trade, working with local communities to reduce livestock depredation, and trying to bolster tolerance for the cats (Jackson et al., 2008). A number of financial incentives are being used to achieve this last goal, which I might write about in a future post. Jackson, R., Mallon, D., Mishra, C., Noras, S., Sharma, R., Suryawanshi, K. (2014). Snow leopard survival strategy. Seattle, WA: Snow Leopard Network. Jackson, R., Mallon, D., McCarthy, T., Chundaway, R.A. & Habib, B. (2008). Panthera uncia. The IUCN Red List of Threatened Specie 2008: e.T22732A9381126. Retrieved from http://www.iucnredlist.org/details/full/22732/0. Panthera. (2016b). Snow leopard. Available at https://www.panthera.org/cat/snow-leopard. That does look good! I’ll be sure to share your giveaway, so that other people can have a chance to win too. I haven’t actually decided if I’m going to enter, because I’m feeling pretty good about where I am fitness wise. I’d much rather allow someone who needs your giveaway more to win it. But I’ll definitely help spread the word. I love how informative this write is. It’s really heartbreaking though that such a beautiful animal is actually on the red list of threatened species according to the IUCN and that there is an estimate of a 10% decline in the next 23 years. Personally I’m strongly against anyone who’s in the poaching business all in the name of fashion and looking good….Hell no. People can look good using other ways which don’t involve killing precious animals. In my country elephant poaching is the trend but at least there is a couple of movements in place to help stop all these atrocities towards our precious animals. We used to have a lot of rhinos but as off now the rhino population is countable and the few that we have left have had to be been put in wildlife conservancy parks and they literally walk around in company of game wardens.Just to keep them safe. The amount of damage done by the human race to this earth is beyond unfortunate. Hey Alexi, poaching is a big problem all around the world right now. I’ve heard about the dire situation facing rhinos and elephants in some African nations, and it really is quite upsetting. One of the unfortunate aspects of living in such a globalized world is that demand for wildlife products in one country can have serious implications for others. For example, the demand for rhino horn in China and Vietnam is making rhino poaching a lucrative business. The same goes for the demand for elephant ivory in China and the US. People need to better understand that our actions can have global consequences now – for both people and animals. Hey Josh, definitely if only China and Vietnam would place a ban on this kind of trade, they would spare the earth a whole lot of damage. Since they are the biggest market for this kind of trade. Yeah If only people would realise the kind of impact and repercussions their actions had, then we’d have a much more healthier planet.